Vincent and the Mystic Pizza Box 7-22-2010: Happy birthday, Vincent! Last year, we hadn't met as of your 51st birthday, so I gave you a whole bunch of belated birthday gifts when we finally did meet on July 22, 2010 at the meet and greet at Joe's Pub. The name of this blog is derived from that momentous event, as pictured above. 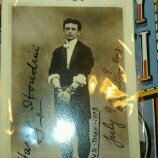 This year, since I was unable to give you your gift in person, I mailed it to your sister Toni's restaurant, Rib City Grill in Utah and she messaged me that you had received it. 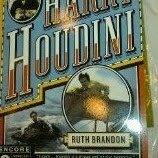 Knowing your background as a magician and having recently visited the Harry Houdini exhibit at the Jewish Museum in New York, I picked up the perfect gift for you in the museum gift shop and sent it via Express Mail so you would receive it before the Ride for a Hero Event on June 4, 2011. Fortunately,you did receive it and, according to Toni, you liked the book and that's good news. I hope you finally have some free time to read a good book and relax. Enjoy your birthday and have a great summer.